Somerset Maugham once said ‘There are few things so pleasant as a picnic eaten in perfect comfort.’ Last weekend we put his theory to the test and enjoy a ‘Picnic with Mercure’ package at the Mercure Ardoe House Hotel in beautiful Aberdeenshire. At selected hotels for stays booked by 31st August and taken by the end of September those lovely people at Mercure Hotels UK are throwing in a free locally sourced picnic to enjoy during your stay. The Wee White Dug was extra excited about the prospect of a picnic, and decided it would be fitting that he wear his best mustard coloured, Harris Tweed bow tie. Not only does Ardoe House Hotel warmly welcome humans, they also welcome wee dugs (and big ones) too. Aberdeenshire is famed for its rugged coastline, quaint coastal villages, fabulous Dracula inspiring castles and stunning countryside – what it’s not so famed for is its weather for picnics. To say we were a little worried as we drove northwards through broody looking cloud was an understatement. We needn’t have worried though, as it turned out to be one of the best days of what has been a mediocre summer so far. We arrived at Ardoe House just before lunchtime to collect our picnic. The hotel exterior was stunning and made an immediate impression – WOW. A typical Scottish, Victorian baronial home set in sprawling grounds – it was very grand. Inside the atmosphere was relaxed and friendly and the decor traditional Scottish with a quirky modern twist. Our picnic was waiting, but even better so was a mini hamper for the Wee White Dug. My heart melted. The boy was over the moon and clearly knew he’d just received VIP treatment from his new friends at Mercure. After much humming and hawing about where to eat our picnic as we were totally spoiled for choice in the area, we finally decided to make use of our National Trust for Scotland memberships and head to Crathes Castle nearby to enjoy it in their beautiful grounds. Crathes looks like something straight out of a book of fairytales. A 16th century tower house surrounded by 240 hectares of stunning garden, woodland and countryside. When we arrived a teddy bears’ picnic was in full swing on the lawn. We found a nice shady spot and opened our hamper. It was packed full of delicious treats. We felt like royalty sipping Scottish raspberry lemonade from champagne flutes. We enjoyed sandwiches, summer fruits, Mackies sea salt and cracked black pepper crisps, fresh scones with clotted cream and jam, homemade pies, scotch eggs, handmade chocolates and Scottish shortbread. It was a veritable feast. The wee dug stood guard and fired off a warning shot in the form of a low menaching growl to any dug that passed and got too close to his picnic. He tucked into his hamper treats. He also enjoyed some small samples from our human hamper. For the adventurous Crathes Castle has a Go Ape centre located in its grounds. After my knee trembling trauma of the previous weekend I decided to give the zip lines a wide berth and instead enjoy a stroll in the formal walled garden after lunch. They were spectacular, in full bloom and a riot of colour. A little corner of paradise on Earth. A Picnic, sunshine and a castle what could be better? I’ll tell you what – two castles. After lunch we headed to another nearby NTS property, Drum Castle. Mr G the reluctant castle explorer looked a little crest fallen at yet another castle suggestion but was a good egg and didn’t complain. Drum Castle was an Irvine Family stronghold from the 14th century and for the 650 years that followed. Like Crathes Castle it’s set in beautiful sprawling grounds – another excellent option for a picnic. Maybe next time. Castle exploring done for the day we took a drive through Royal Deeside to Ballater. The heather was in full bloom and the hills had a lovely purple hue. Earlier this year Royal Deeside suffered terrible flooding when Storm Frank arrived with a vengeance. Scotland watched the news each evening with baited breath as Abergeldie Castle threatened to slip from its fast eroding riverside setting and into the River Dee. Thankfully the flood abaited and the castle was saved by the skin of its teeth. The devastating damage a flood can do was all too apparent when we stopped to snap the historic Cambus O’ May Suspension Bridge which was built in 1905 to replace a ferry which once crossed the River Dee. The bridge was buckled, bent and badly damaged but luckily not destroyed. After a lovely day spent exploring in the sunshine we headed back to the hotel to check in. The wee dug quickly recognising it as the place that doled out free picnics. He dragged me through the front door like a bat out of hell. Our room was beautiful. Contemporary and modern – high end toiletries and a lambswool bed throw gave it a real feel of luxury. We both agreed we’d stayed in 5 star hotels far inferior to this 4 star gem. Having picnicked with Mercure we thought it was only fitting that we dined with them too. Food is served in the bar, brasserie and restaurant. We ate in the restaurant, Blairs. The waiting staff were friendly, relaxed and attentive. My favourite – nothing makes for an uncomfortable dining experience more than stiff, overly formal waiters. The menu like the hotel stayed true to its Scottish roots. The produce was locally sourced and the menu Scottish themed. We both started with the Vine tomato & red pepper soup – delicious was the consensus. If you’ve been following this blog for a while now you’ll know that we’re both a wee bit obsessed with soup. You could say we’re soup connoisseurs! It arrived looking pretty as a picture with an artistic flourish which never quite works when you try to replicate it back home. For main I chose Lanarkshire potato gnocci in a tomato sauce with crispy basil & rocket salad. Mr G opted for Ayrshire pork tenderloin in a ras el hanout jus. Both dishes were really good. For dessert we both went for the chocolate & burnt orange tart. It was rich and flavoursome. Fit to burst we collected the wee dug from the room where he’d been sleeping off his picnic as we ate. We headed outside for some fresh air and to walk off dinner. The night was warm and still. A perfect summer evening to end a perfect summer day. If the hotel looked grand by day it looked even better lit up at night. After a comfortable nights sleep, aided by a super comfy bed and an afternoon spent outside in the fresh air we were up early and ready for breakfast. When staying away from home breakfast is undoubtedly my favourite meal of the day. I love the anticipation of the day ahead and chatting over a nice cup of coffee. We both agreed we needed a walk before heading home. How about the cliffs by Stonehaven I suggested? Mr G rumbled me in an instant. Would that be the cliffs by Dunnottar Castle? He asked. He knows me too well. After bidding the wonder staff at Ardoe House Hotel farewell, and much fussing over the Wee White Dug later we headed homewards via Dunnottar Castle. Dunnottar is a magical medieval fortress which sits perched precariously on a rugged clifftop. It’s one of Scotland’s most iconic and instantly recognisable castles. It’s steeped in myth and legend. A ghostly lady dressed in traditional green plaid, William Wallace, Mary Queen of Scots, the Scottish crown secreted away from advancing Cromwellian forces to lie hidden for years. It’s no surprise that when Disney Pixar visited the local area to do some research for the animated movie Brave they were so inspired by the castle that they featured it in the movie. When we arrived a heavy sea haar clung to the coastline obscuring the castle. Only the faintest of outlines was visible through the damp, blanket of white. It was amazing to see, dramatic and atmospheric. It’s probably my favourite view (or lack of) of the castle yet. As we explored inside the sea haar started to burn off. More and more of the castle revealed itself to us. The wee dug charged around sniffing every corner as he does with each new castle interior he visits. We reluctantly headed home from our wonderful Aberdeenshire break. I suspect it won’t be too long before we return. Although I was invited by Mercure to stay on a dinner, bed and breakfast basis to sample their ‘Picnic with Mercure’ package all thoughts, opinions and musings in this blog are accurate and entirely my own. This blog was brought to you today from my sun lounger on the sunny Venetian Riviera. Previous Go Ape, Peebles with the Weeeeeeee White Dug! wonderful, as usual. the photo of Dunnottar Castle in sea haar is stunning! stuck in the house here in north Missouri with severe ragweed allergy – ready to go back to Scotland for relief. have fun! Thank you – it looked absolutely stunning in the haar. So mysterious. Hope your allergy clears up quickly . Every blog you write is so wonderful and complete and completely wonderful, that I could never pick a favorite! This–and the photos–follows that example. I’m going to share it. 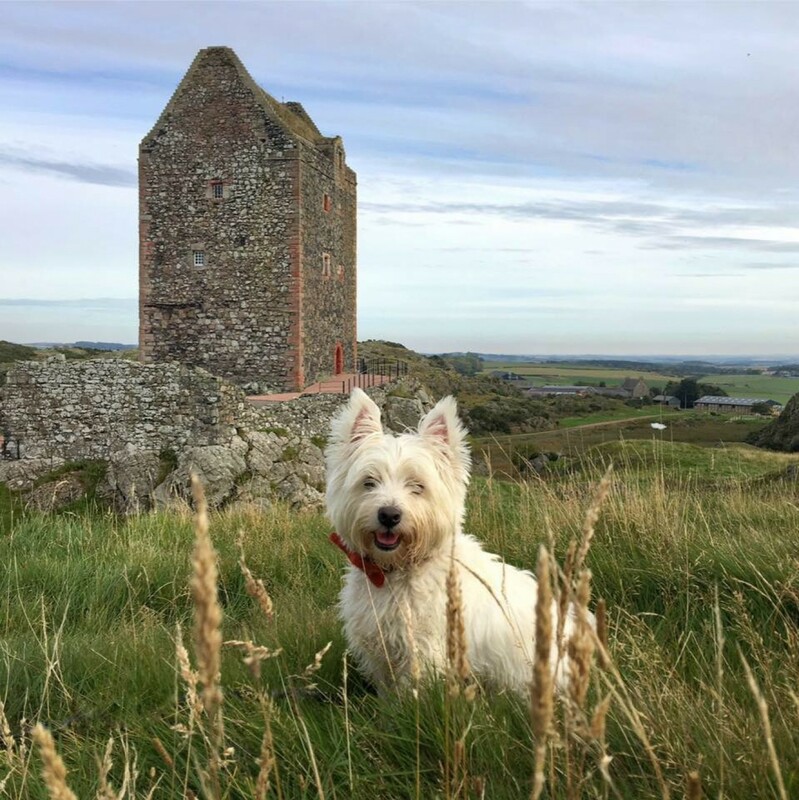 More folks need to read about the wee white dug as he makes his way around bonny Scotland. Thanks for another fascinating adventure. Thank you so much for your kind comments. You have been such a support to me as I get this wee blog up and running. Please do share and help spread the word. Sounds like you had a grand time on your picnic. I enjoy your Scottish adventures, especially all those tales and magical castles you visit, hopefully one day I can visit your wonderful country. It was lovely. Hope you get to visit to see for yourself some day. Your beautiful country is on my bucket list. Wow–such lovely travels! I enjoy your blog (or is it blug?) immensely. Somehow it all seems so magical there in Scotland. Some day… Or would you like to adopt a grandmother? I am available! I even come complete with twa Corgis who, I’m sure, would love to picnic with The Wee White Dug! Sorry meant to say VIP !! What an idyllic weekend, so nice to read that Sam received VUP treatment as well!